Ronaldo Set To Replace Messi As PES Cover Star? With Konami revealing that Lionel Messi has departed the PES series this year, a replacement has yet to be named for Pro Evolution Soccer 2012. The usual names have been doing the rounds in the PES online communities - Cesc Fabregas, Fernando Torres and Xavi all getting mentions. But it seems that Cristiano Ronaldo is the clear favourite, and looks set to become the new face of PES later this year, with the release of PES 2012. Admittedly, all the signs are pointing to the Portuguese star. "Did you see Cristiano Ronaldo's fantastic goal in the World Football Challenge match against the LA Galaxy last weekend? Check it out now and make sure to come by Qualcomm Stadium in San Diego tomorrow to see Real Madrid take on Chivas Guadalajara. Keep an eye out for the PES tent at the stadium for your chance to play and win! Dalton, PES-Team"
"Did you just see this goal Messi scored? Unbelievable, isn't it? /Nils -PES Team"
"Messi scored twice! Game over? /Nils -PES Team"
Since March, the PES team have only discussed PES 2011 related topics (Konami events, PES 2012 information, Champions League updates, Lionel Messi goals and leading on from that, Barcelona successes, etc - and also, Fernando Torres was mentioned when he was in London for a PES 2011 3DS photoshoot. In the official PES 2012 press release, Jon Murphy also stated that "the new player has all the attributes of the new game, in that he is a strong all-rounder, skillful, fast, and capable of making magic happen on-field." That sums up Cristiano Ronaldo pretty well, right? 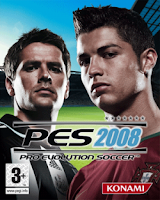 With the release of PES 2012 only a few months away, are Konami now turning their attentions to the new cover star of the Pro Evolution Soccer series? You'll remember that alongside Michael Owen, Ronaldo was on the cover of PES 2008. So after 4 years on the sidelines, will Cristiano Ronaldo be making a return to the series?